Next month WRHA will be moving into North Warwickshire for the first time when it takes ownership of two affordable bungalows in Corley. 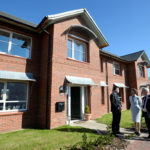 North Warwickshire Borough Council has provided some funding to enable the housing association to purchase the new homes. This summer will see another first, with WRHA aiming to submit plans for a groundbreaking site in Bearley. WRHA is investigating the possibility of a modular development, which would mean the seven affordable homes would be completed in record time. Richard Mugglestone, Company Secretary of Warwickshire Rural Housing Association, commented: “Our 30th anniversary year is set to be an exciting time. As a small rural affordable housing provider, expanding into North Warwickshire is a major move for us. Pictured above is WRHA’s flagship development, Keyte Gardens in Wotton Wawen, which was opened by HRH The Princess Royal last Autumn.